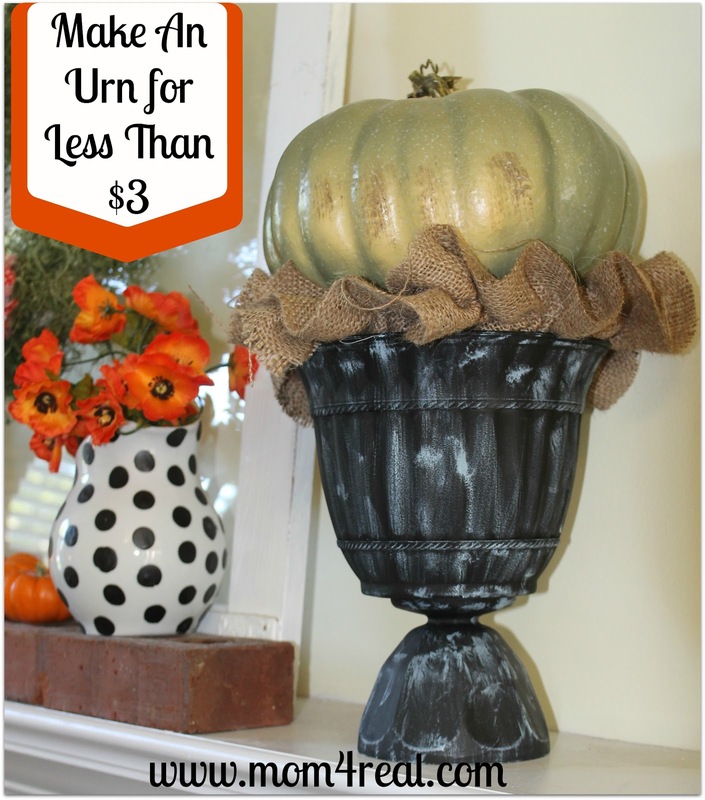 Today I am going to tell you how I made myself two urns for under six dollars. I knew if I could use a cheap plastic flower pot for the top, I just needed to find a base. 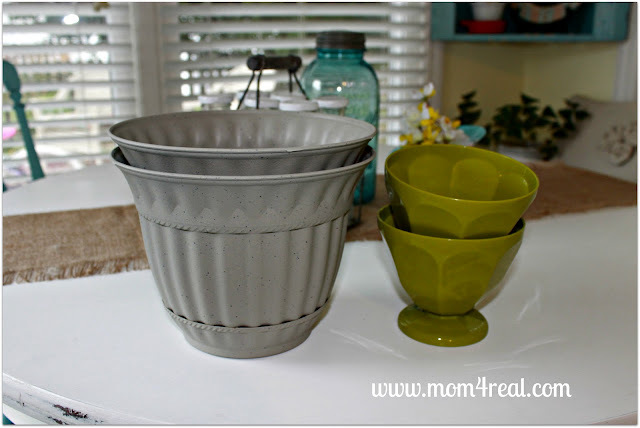 So, as I was walking through Wal-mart one day, I saw these lime green ice cream bowls, and they were $1.98 for the two of them. I grabbed them up and flipped them upside down to see if they would work. I literally ran to the garden center to see if I could find some pots. These were only $1.98 each! I brought them home and glued them together with E-6000 adhesive, and let them dry overnight. Then, I spray painted them with chalkboard spray paint. 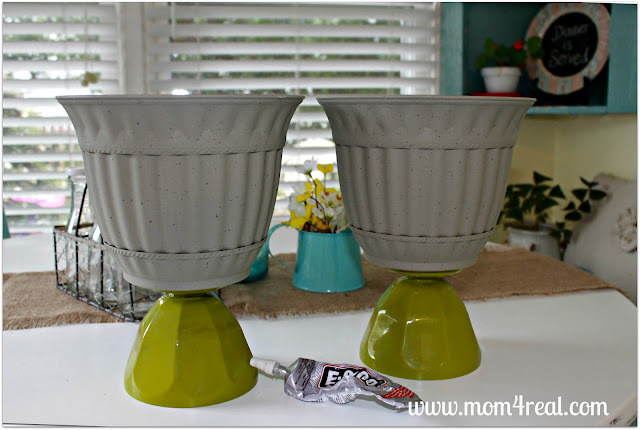 I used the chalkboard spray paint for a matte finish, then I lightly brushed on some aqua acrylic paint to give them an aged look. And they were just what I was looking for! I can’t wait to put some rosemary trees in them for Christmas! « Southern Living Cookbook Giveaway! Now I have another project to add to my ever-growing list to do. They just don’t get done. Gee, maybe if I spent less time admiring everybody else’s work…. I’ll gather supplies now and work inside in the winter. That’s my story and I’m sticking to it. Great idea, I definitely pinned this and am going to try it! What a great idea! I’ve been pining over the large urns I see everywhere filled with mums and pumpkins, but they tend to be pretty expensive, especially in pairs! Totally pinned this! Oooh, sooooo clever! They look great! Thanks for a great idea. 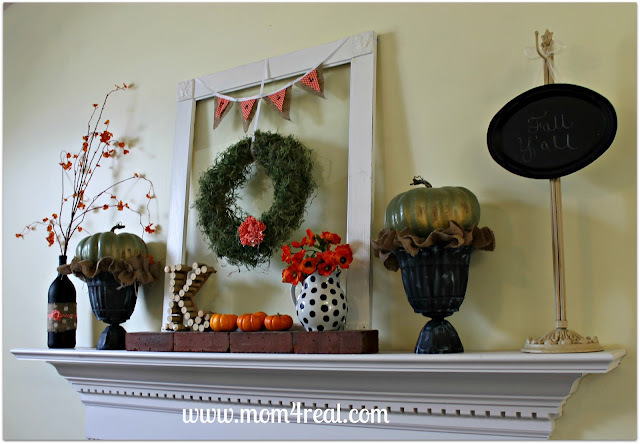 This is a fantastic idea–I’m pinning and going to try it out! 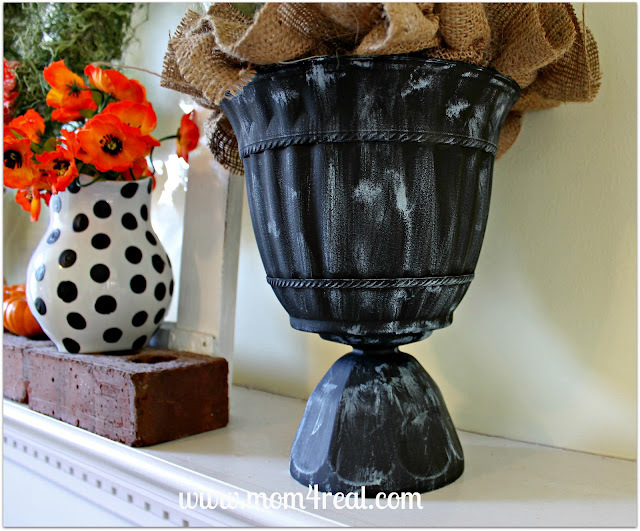 Thank you so much for sharing, and what a creative and clever way to craft an urn–I just love it, Jessica! I really like this idea! opens up a world of possibilities to use different shapes- great job!